Nose: Black pepper and vanilla initially, with spicy and floral notes to follow. Palate: A toasted, creamy flavor that is also bittersweet. Hints of dark toffee and almond come to the fore, and gives way to a melted sensation that is equally voluptuous as it is well-balanced. The alcohol content does not overpower. It has an expressive, elegant and lively finish. 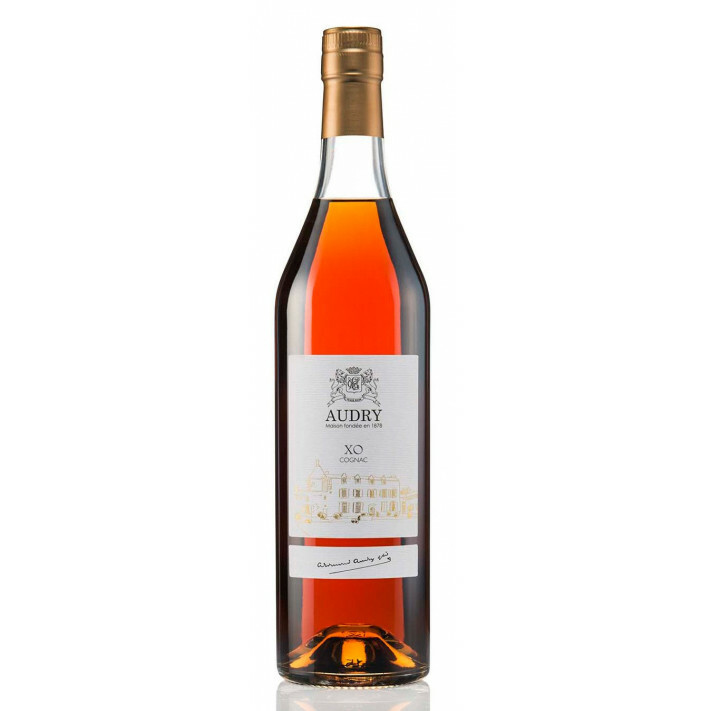 Created with eaux-de-vie descending from two premium crus, the Grande and Petite Champagne, the Audry XO Cognac is a unique insight into the precious treasures of the Audry Paradis cellar. Created from blends of the original reserve, as an Extra Old Cognac it has been impressively aged between 12 and 30 years. With multiple layers thanks to the finesse of the Fine Champagne, it is something to be savored right to the very end. The Grande and Petite Champagne are particularly celebrated thanks to the unique composition of the soil. Due to thousands of years of fossilization and its particular maritime climate, the soil has a high chalk and limestone content. This makes for faster drainage, and the vines are therefore naturally watered throughout the year. What’s more, the undulating hillsides of the Fine Champagne equal optimum exposure to sunlight. All of these factors make for a very refined and lengthy finish in the eaux-de-vie of the Audry Extra Old Cognac, which is made of more or less equal parts of spirit from each terroir. After it was founded in 1878, Audry stopped selling Cognac in the 1950s. A number of larger stocks of older base spirits were kept in the cellar, in the hope that one day Audry would rise again as a Cognac house. For limited releases, Audry now dip into their precious Limousin and Tronçais oak casks to select the best of their eaux-de-vie from the Fine Champagne, which have been dormant; maturing beautifully for decades. To create an aromatic grape distillate, they distill the Cognac in copper alambic Charentais stills by using a ‘swan’s neck’ pipe. It is this process that allows the spirit to maintain its Fine Champagne character. The oak of the barrels plays an important role, as the wood is porous and allows for intermingling between spirit and tannin, with the help of oxidation from the surrounding atmosphere. Blended with incredible savoir-faire, they are then left for years and sometimes decades before bottling. Make the most of this expressive finish by enjoying the Audry XO neat or on ice. The bottle is stylish and simple with the family crest and a gold-leaf sketch of the estate. The presentation sleeve is equally as elegant yet eyecatching, in a gorgeous tangerine color. I'd say this is one of the best Grande Champagne cognacs I have ever tasted. Absolutely spectacular taste.